Great effort and an interesting study. I’m not quite sure about the methodology though. Where did you take the data for each particular listing from? If you were checking the Place page itself, and if you did the research after the last major Place page redesign, I believe the results would be rather inexact. After that change Google started showing only the top 3 third-party review sources in the “Reviews from around the web section” (as seen on the screenshot). One could also find the top 4 third-party review sources if checking the organic/Places SERP (at the additional side menu that could be opened for each search result). However, none of these two is the full list. Before the last update when Google hid the third-party reviews there were many listings with 10+ review sources. Just some personal thoughts. Once again, great study and a decent reference source. My methodology: I did do the research after the last big update, but I didn’t get the data from the Places pages themselves; I checked the “previews” that you see from the SERPs. 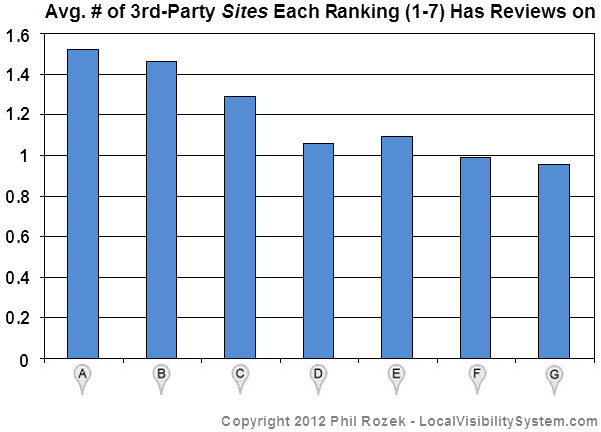 Which means that I was able to see the top-4 third-party sites *on which each business had reviews*. As the spreadsheet shows, relatively very few of the businesses had reviews on 4 third-party sites, though now that you mention it, I suppose it’s possible that those businesses may have reviews on more than 4 sites (doh!). I think the accuracy of my data depends on one question (which you brought up, of course): can businesses/Places pages with FEWER than 4 third-party review sites listed in the “preview” area actually have customer reviews on other third-party sites that *do not* show up in the “preview” area? In other words, even if the “preview” area says that a given business has (say) reviews on 2 different sites, is it possible that that business actually has many more “hidden” third-party sites where it actually *has* customer reviews? If the answer is “no,” then some of my data–some of the “4’s” on the spreadsheet”–may be slightly off. If the answer is “yes,” then all my data is probably a bit low: for instance, maybe the average #1 ranking has 10 third-party reviews rather than 8-and-change. So, it seems possible–maybe probably–that my numbers may be slightly low (I don’t think it’s possible for them to be high, though). Even if so, I believe the “curve” would remain pretty much the same: the top 2-3 rankings would have more reviews (and on more sites) than the lower 4-5. I saw that to be the case back in July, when I did this kind of analysis of *all* the reviews–Google and third-party combined. With the picture: that was just a boof on my part. Even though I looked at the “preview” area for my data, I took the screenshot of the third-party sites listed on the Places page. I’ll get a different pic up there ASAP. Good catch! Didn’t mean to write a book just now, but, long story short, I’d be really interested in knowing what you know about my “hidden review site” question (I’ll probably look into it myself also). Would you ever consider doing this same type of study based a couple of different factors? 1. What effect having the owner of the the Google places page has when they do reviews of other businesses within their same geographical location. 2. What effect on ranking does the development of a Google profile have on a Google Places page listing. 3. How important is a businesses geographical information on page ranking. Maybe you have done these test already, but I would be curious to hear your thoughts. Those are great ideas to do for studies. Thanks for suggesting–hadn’t thought of them in this context. 1. Not sure exactly what you’re referring to here. Just a shot in the dark here, but are you wondering what effect it would have on the rankings of a given business/Places page if the owner of that business posts reviews of other local businesses? 2. I *believe* that your ranking won’t necessarily be higher if (for example) it’s 100% complete than if it’s 85% complete. Of course, if one doesn’t bother to write a “description” or pick more than one category, the chances probably aren’t as good that he/she will rank well, but that’s simply because Google looks at those aspects of your listing in order to determine how relevant your business is to your target market. Of course, it’s good to have a complete listing, but you won’t necessarily get any brownie points for it. 3. Not totally sure what you’re referring to here; I see a number of possible meanings. However, I can say that location is the single-biggest determinant of which local markets you’re visible in, and how visible you are in those markets. 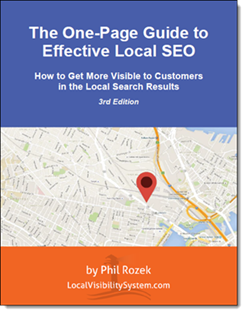 As I tell people all the time, you can’t take the “local” out of local search; location matters quite a lot. Hope that helps. In any case, I’d like to do more studies along the lines of what you’re describing. They’re great questions. Great article! Sadly I need lots of graphs to understand how all this works. In your opinion what are the best 3rd party sites to send customers to do reviews? Thanks so much, I am totally now following you on twitter! Even that’s getting a little old. Ignore Yahoo. Facebook is generally a good place to encourage reviews now.